American Beauty is New to our Vacation Rental Family! Tucked on the coast with 68 feet of private frontage on Lake Michigan, you will love experiencing life on the lake! Let the sounds of the crashing waves lull you into relaxation. The expansive front deck is the perfect place to unwind at the end of the day and watch the sunset. Sprinkled with outdoor furniture including sun loungers, a sofa, chairs, and a table, there is plenty of space for your group to come together and relax. Head down the tiered decking towards Lake Michigan where you'll find a unique deck stuck to the side of the bluff. What an ideal spot for panoramic Lake Michigan views while you enjoy lunch in the sunshine. 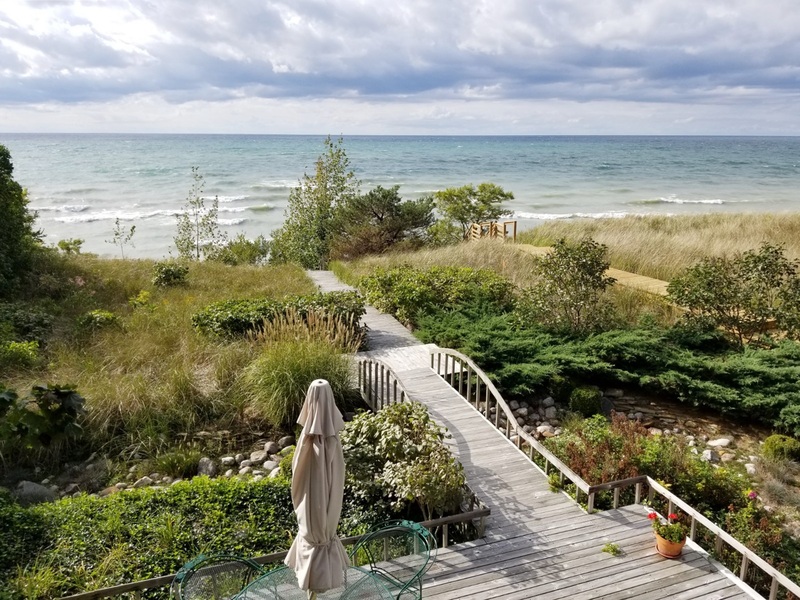 Descend the rest of your private stairs to Lake Michigan where you can go for a swim or a leisurely stroll along the coast. Due to the ever-changing water levels, each day brings difference beach conditions - though most days there is at least a few feet of sand to enjoy. Back at American Beauty, you'll find a delightful three season sun room to enjoy your morning coffee or evening nightcap. This room overlooks Lake Michigan and is complete with a table that seats four and wicker furniture. The open living room boasts soaring ceilings and plentiful windows overlooking the lake. The comfortable sectional sofa is great for kicking back and catching a movie on the flat screen TV - there is a Roku player and wireless internet for your entertainment. The adjacent built in desk is a great work area if you need to catch up on emails while on vacation. Next space over is an open dining and kitchen area with all new stainless appliances, snack bar, and large dining table. You'll have everything you need for a meal at home including a microwave to warm up last night's leftovers. Also on the main level are two bedrooms and a full bathroom. The queen bedroom is a walkthrough room leading to the king bedroom. However, both bedrooms have access to the outside deck space so you would not have to wake the other to get into the main part of the home. Inside the queen walkthrough room is also the full bathroom - complete with shower tub combo, two sinks, big mirrors, and tons of storage space. Head upstairs where you'll find even more comfortable space. The upper level covered balcony is a true gem with a bistro table and two chairs. Even if it rains, you'll be able to sit here and enjoy the sights and sounds of Lake Michigan. In fact, it would be a magical space to watch a storm roll in. Just down the hall is a queen bedroom with access to a small private deck. The bunk room at the end of the hall is a delight for children of any age - two sets of bunk beds, each with a full on bottom and twin on top. This room also has a TV with video game player. This level is complete with a full bathroom with walk-in shower and huge linen closet. 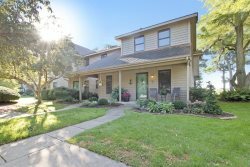 A unique feature of this home is the bonus room above the detached garage. Connected by elaborate decking, this room is being filled with game tables and being made into the most fun room to hang out. Photos to come as updates are made. For the little ones in your group, head just 0.2 mile down the road to Westside County Park where you'll find an awesome playground and picnic area. Also close by are various local farms for fresh produce, Fenn Valley Winery, Virtue Cider, Crane's Pie Pantry, and antique malls galore. Whether you're looking for the best meal you've ever had, a Broadway quality production, or a boat ride along the river, fun for everyone is close by in downtown Saugatuck, Douglas, and South Haven. This home can comfortably sleep 8 adults. However, there are beds for more if your group is made up of a mix of adults and children. In the bunk room, the clearance from the bottom to the top bunk is less than 2ft and may be uncomfortable for some adults. The lower level walk through room does not have any furniture, but you may bring an air mattress. We ask for a total of no more than 12 people with no more than 8 being adults. A flight of stairs is required to get to the main level of this home. Due to the ever-changing water levels, beach conditions change daily.